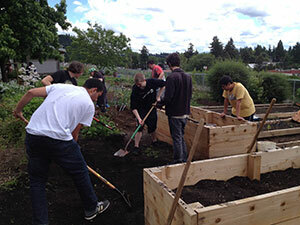 Students work the land in the Madison High School community garden. Image courtesy of Madison High School. From seed propagation to food justice, Susan Weincke has all the bases covered in her urban agriculture curriculum. Teaching at North Madison High School in Portland, Weincke blends practical experience with plant science to bring sustainable agriculture to a new generation of urban dwellers. After working on educational and commercial farms and owning her own landscaping business, Susan Weincke became the Garden Coordinator at Madison High School in 2010. Through the government’s Career and Technical Education program, Weincke became a co-teacher at the school, assisting in science education. Today, having completed her Master’s in Education, Weincke is the agriculture teacher for Madison, using a school garden and outdoor classroom to bring her lessons on sustainability to students in grades 9 through 12. Currently Weincke offers two classes: sustainable agriculture and urban farming. The agriculture class focuses on soil chemistry and needs, basic plant science as well as practical gardening techniques. Students produce a soil management plan, amend the soil, plant cover crops and develop a crop management plan, planting calendar and actually sow the seeds and maintain the beds. In the urban farming course, students propagate and harvest plants, create an urban farm business plan, manage plant sales and sell produce at a local farmer’s market. Both classes incorporate food system and food justice discussion. Weincke’s curriculum is aligned with the horticulture course at local Clackamas Community College allowing students to earn college credit for taking her classes. One of the main challenges that Weincke faces in teaching urban agriculture is ensuring students have the background knowledge to understand the concepts. “It’s really amazing to see the evolution of my students throughout the year. At the beginning of the year they are very apprehensive, don’t really know what’s going on and then at the end of the year they know what to do and they take charge and they’re working away at their plots and they know how to plant because they’ve done their research and they’ve watched the demonstrations; it’s cool to see that transition,” says Weincke. Peer tutoring and subject scaffolding techniques further the student’s agriculture studies. Inspired by food justice guru LaDonna Redmond, Weincke hopes to aid students in making tangible connections between their lives and issues of food inequality. Weincke feels supported by the school administration and applauds their efforts to bring agriculture to their urban students. Now finished with her graduate studies, Weincke hopes to focus on raising funds and volunteers for her programming as well as establishing a ‘Future Farmers’ style club for interested students. With the generous donation of land across the street from a recent ten acre purchase by the Dharma Rain Buddhist community, Weincke hopes to expand the school gardens giving more students the space and opportunity to grow food and build informed futures in the busy streets of Portland. 10 Successful Farm-to-School Programs Across the U.S.A.